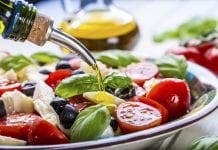 THE Mediterranean diet is living up to its reputation after a new study revealed it can reduce heart attacks, strokes and death rates for people in high-risk categories. According to a major clinical trial, changing the balance of foods can cut the risks, even before an attack. Around 7,500 people in high-risk groups took part in the trial, the first of its kind, which was cut short because the results were so clear. The participants were Spaniards between the ages of 55 and 80. More than half were women and all were in high-risk groups including being overweight, smokers, diabetic or at risk of heart disease. 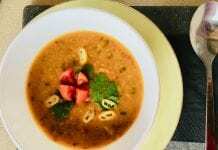 The group was split with half following a Mediterranean diet and half a low-fat diet. Participants following the Mediterranean diet had to eat five servings of fruit and vegetables a day and fish three times a week. Additional olive oil or nuts were also provided daily. White meat was recommended over red and participants were encouraged to eat beans, peas or lentils at least three times a week. Overall, the results showed that those on the Mediterranean diet reduced their chances of having a heart attack or stroke by 30%. Organisers said it was unethical not to recommend the diet to participants as soon as possible. Dr Ramon Estruch, leader of the study and a professor of medicine at the University of Barcelona, said he was surprised by the results. He believes the diet worked because it incorporated the whole nutritional package. Professor Rachel Johnson, from the American Heart Association, said looking at different risk factors was crucial. I can’t speak for the average Spaniard, but we spent several weeks in various parts of Andalusia this summer and felt I ate healthier the whole time I was there than what I eat in the US! I agree my time living in Spain was when I became the healthiest. My cholesterol went down as well as my weight and not to mention my skin..I no longer needed the expensive meds I was taking for breakouts.